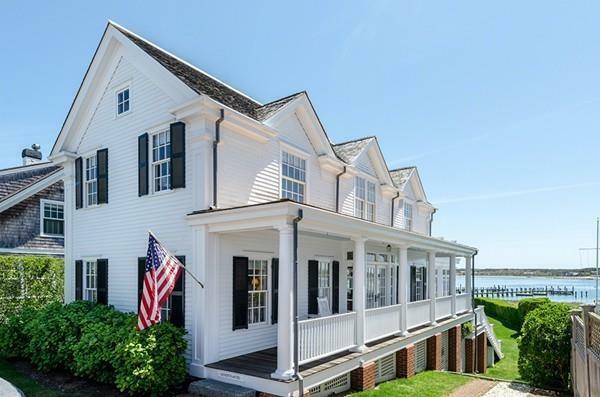 Water Street Harbor House is an elegant Edgartown vacation rental home. Conveniently located at 119 North Water Street in Edgartown, MA, this property offers an idyllic Martha’s Vineyard vacation experience. The stunning property features a classically styled covered porch, and front entryway that opens into a dramatic, open-designed Dining and Living Room with floor-to-ceiling windows that maximize the grand views. French doors open onto an expansive mahogany deck with sweeping views of the Edgartown Lighthouse. There are a total of three bedrooms, each with en suite bath, including a second-floor Master Bedroom Suite with vaulted ceilings, and private deck. Accommodates up to 8 people. Why Water Street Harbor House is One of the Best Places to Stay in Martha’s Vineyard? Combine the best of in-town and waterfront living. Stay in the heart of historic Edgartown Village on prestigious North Water Street. Walk out your front door to the restaurants, shops, ferry, theater and other downtown attractions. Or, stay home to enjoy dining al fresco and relaxing on expansive decks overlooking Edgartown Harbor and Lighthouse. If you are boater, ask about availability on our private deep-water dock with direct access from the back of the property. Water Street Harbor House is owned by the Harbor View Hotel, which means you get to enjoy the high-end amenities of the Harbor View Hotel, including the pool and restaurant. The Harbor View Hotel is located right across the street, which is convenient for accommodating extra guests. To learn more about the Harbor View Hotel, go to https://www.harborviewhotel.com/.